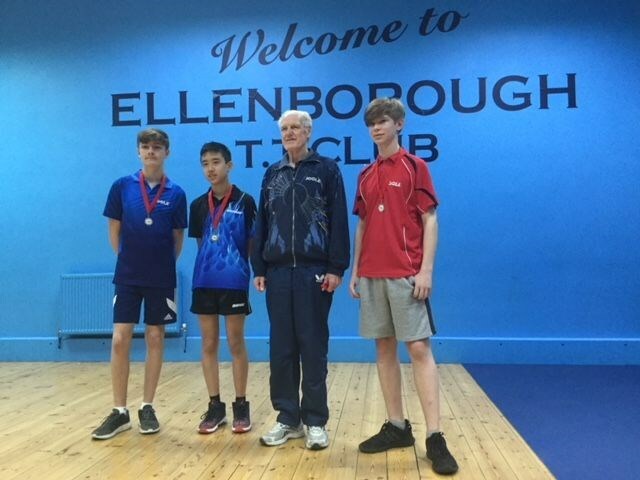 Massive congratulations from everyone involved with the Brentwood League to Toby Kelly, Jason Yeh and Zach Antoniou on finishing top of Division Two of the National Cadet League. 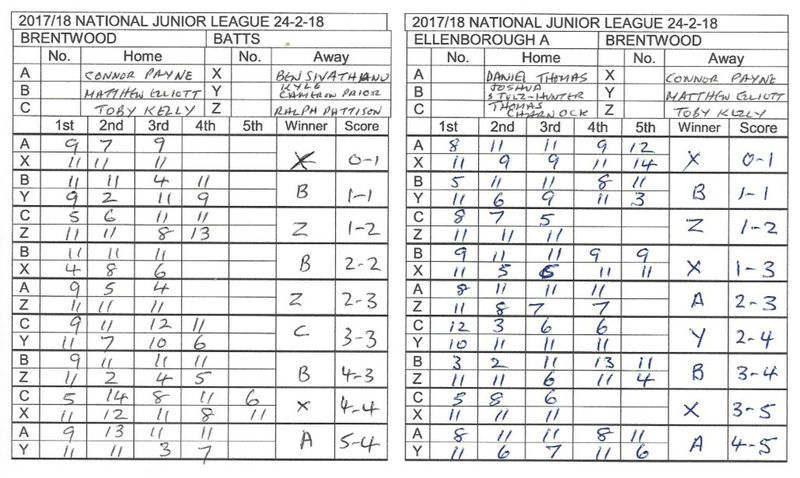 The Ellenborough hall players on the final day of the season’s NCL were enthralled by the fluctuating team rank positions in the top two teams of Division 1 (Ellenborough A gaining silver and The Reach Academy A eventually succeeding in winning the gold). Fortunately for The Reach Academy A, it was helped upwards by the win of BATTS 1 over Ellenborough A through a match score of 6-3, whereas on the other hand, BATTS 1 lost 0-9 against The Reach Academy A which team then held great endurance and went on to win 9-0 against Mossford A to secure the first position. In the same while, following on unwaveringly from previous days the Division 2 Brentwood team made an even bigger lead over Spins TT Academy with the help of the talents of Toby Kelly taking all 9 individual matches over 3 rounds of the teams’ 9-set matches and his team partners Jason Yeh and Zach Antoniou who added 7 and 6 individual matches respectively to reach gold on the finishing line. There was a heavy alternating current engaging the teams playing 5 rounds of 6-set matches in Division 3 as BATTS 2 domineered the way at the beginning closely with Ellenborough B but went through an unavoidable change of players on the final day that resulted in a slightly harder struggle that put it in third position after The Reach Academy C won all their 5 rounds of the day by substantial margins. The winning Ellenborough B team, despite the weakening of their first match against Mossford C by some void sets owing to the untimely arrival of one of its players, went on to reach a close win over The Reach Academy C – the results of which had to be calculated by the number of games won after drawing in sets. The Reach Academy A made superb gains towards a shared first place in Division 1 with Ellenborough A – enough it seems to steam ahead of BATTS that is currently holding third place. 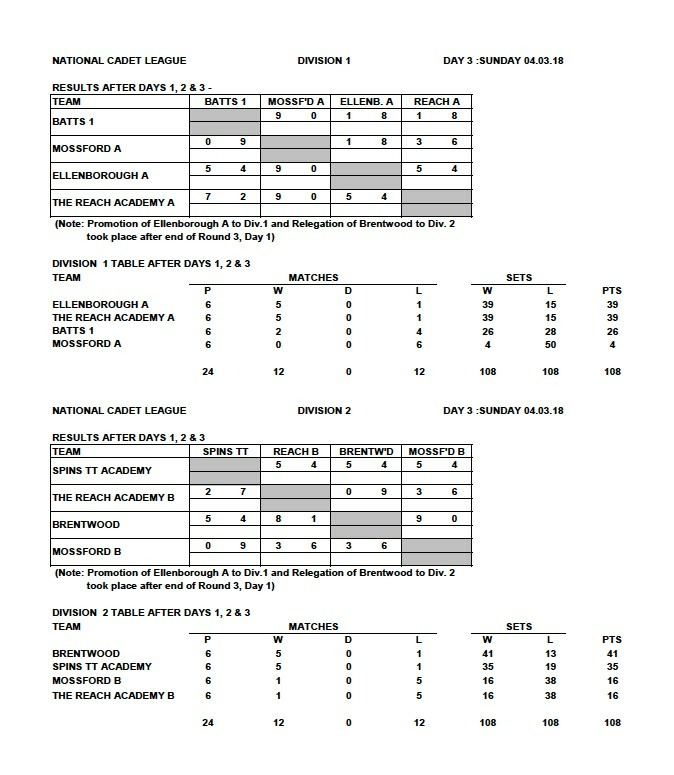 Spins TT Academy in Division 2 are still striving to overcome the strength of Brentwood and (after both teams pursue an expected further fight-off against the teams of Mossford B and The Reach Academy B) they will have a match against each other in the last round of the final day. With an encouraging sign that we shall have the new table tennis cushioned flooring completed for the next, final NCL event on 25th. 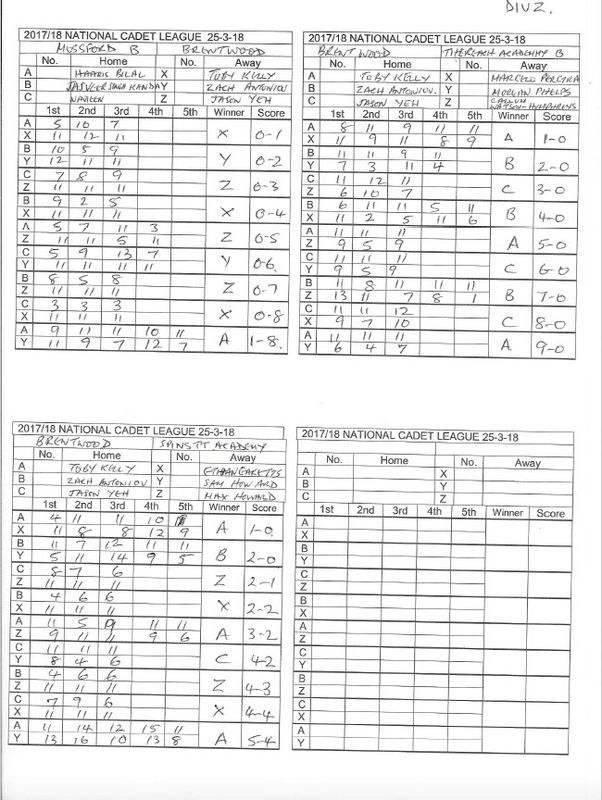 March, the Division 3 players should find an extra spring in their step to enhance their formidable high-ratio scores which have drawn spectators and coaches to appreciate the art of progress in skills training followed by ecstasy in the “short and sweet” match results. The award ceremony will be an exciting one, particularly for both the Ellenborough teams which may see themselves in first positions in both Divisions 1 and 3. 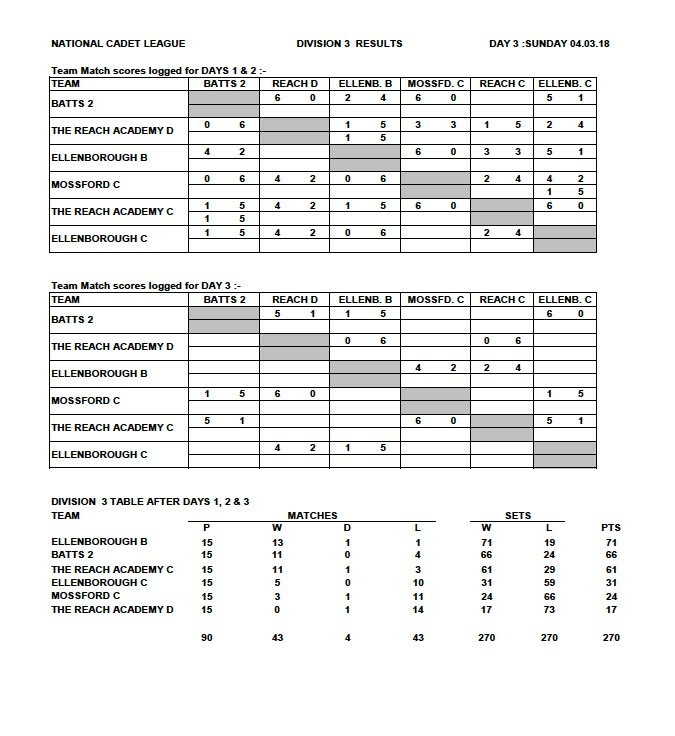 The usual report of results are attached, a version of which will also be published on our Ellenborough TTC website. My reminder and schedules will follow in a week’s time concerning the final NCL event. 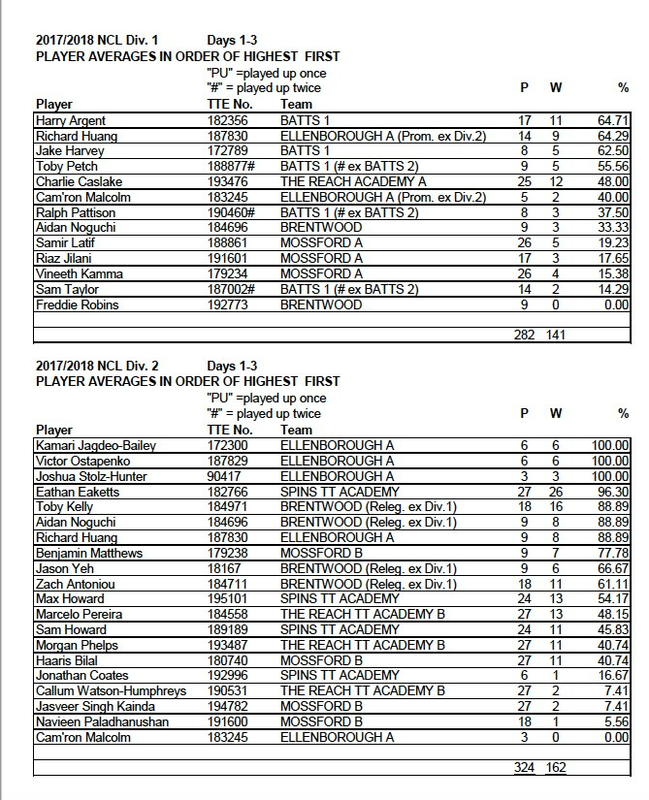 Well done to all the junior players who represented the Brentwood League recently at this event. This Day 3 event was slightly plagued by a shortage of players owing to either illness, injury or school exams. Satisfactorily, in Division 1, Brentwood nevertheless put up a good fight with their two players and Ellenborough A’s Daniel Thomas and Joshua Stolz-Hunter put through some heavy wins which propped up the player-short scenario where a couple of additional players later arriving in half-way through the rounds stepped in but not winning. 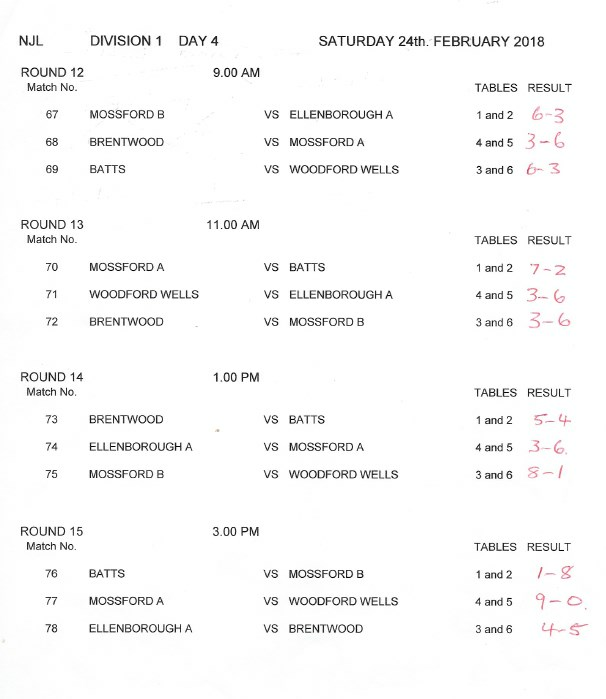 Then, in Division 2 Mossford made an excellent choice of rotating three players to “play up” when faced with the same situation and performed fairly well except for their Mossford C team which suffered a defeat of 2-7 against Ellenborough B. The Ellenborough B’s players Richard Huang, Victor Ostapenko, Kamari Jagdeo-Bailey, and Cam’ron Malcolm all helped to boost their team into top position of Division 2 at the end of the day despite some strong opposition by Adam Sharoui of The Reach Academy A team. 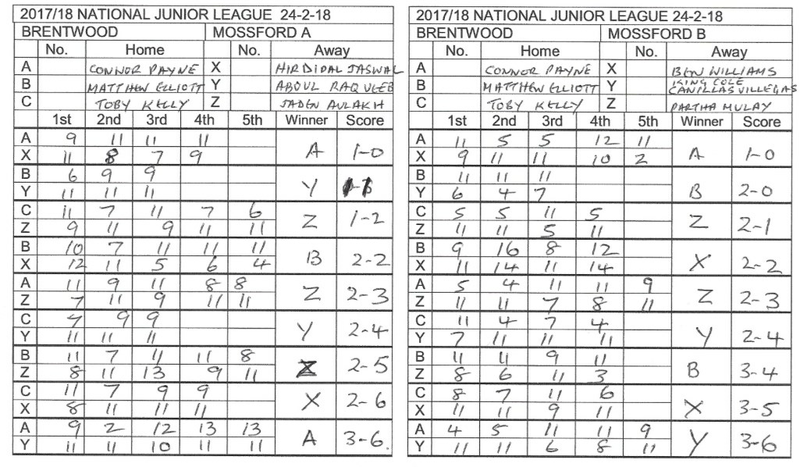 As you will see from the tables, Division 1 is still led boldly by two teams – Mossford A and B even though Woodford Wells, which, presently holding the bottom position, made a quick come-back in beating Mossford B 5-4. 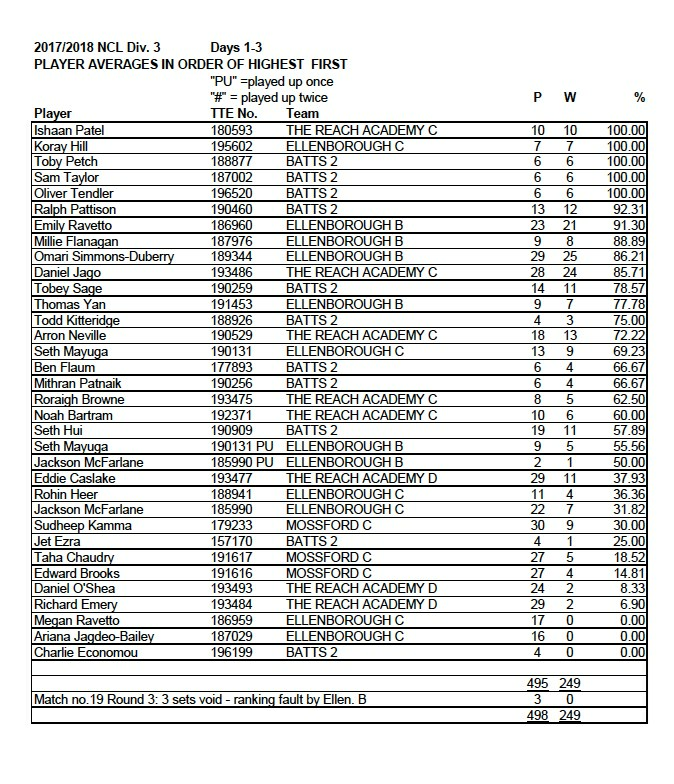 Coming into view at the next event we shall see that 6 players have “played up” and 2 players have moved up to higher teams as they have played up more than once. Therefore, to make the event a spectacular last one of the season accompanied by the medals’ award ceremony, it is recommended that team managers and players make good, advance preparation to put in full teams. Naturally a preview/reminder of the situation will follow on the next R&R list of names about a fortnight before this last event due to be held at Ellenborough TTC on Saturday 24th. February 2018. Ellenborough are third on Countback.